Dividing perennials is an easy way to obtain plants for your garden or to share with friends. Some plants become overcrowded and may die out in the center, become sparse, or stop blooming and then it’s time to divide them. While we generally think of dividing plants in the early fall or spring, many plants can be divided in late fall or winter. If you have to dig up parts of your garden at this time of the year, there are certain perennials that can be divided at anytime. 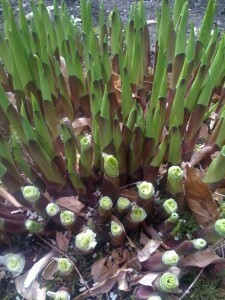 You can even leave hosta and daylily plants that have been dug up on the lawn to freeze and it won’t hurt them. Asters and mums can be dug and divided now, as long as you replant them immediately. Lighter-weight divisions like these should be left to spring if you have a problem with frost-heaving areas east of the Cascades and north of Mt. Vernon away from Puget Sound. Hosta, hemerocallis, astrantia, astilbe, darmera and helianthus can all be dug up, halved or quartered, with a sharp shovel (or axe) and replanted. It’s best to remove any damaged or broken bits. If the crowns come apart easily or smaller pieces come loose, pot them to give away. Protect these pots from a hard freeze, placing them close to the house, in a cold frame, or covered with evergreen branches under trees. While you’re dividing your hosta plants, make certain to protect the newly emerging tender pips not only from slugs but from local bunnies. November and early December is the best time to dig and divide peonies and true lilies. 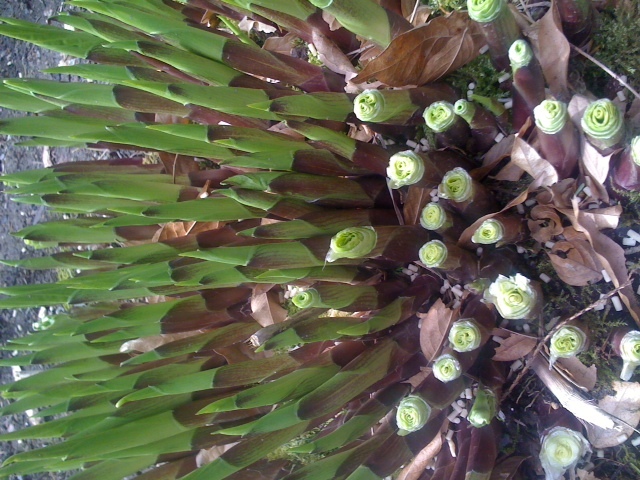 The lilies are dormant in November and will move best then. Peony divisions are usually taken down to 2-3 or 3-5 eyepieces. They will reliably bloom the following spring; spring divisions less so. Other perennials that can be divided now include brunnera, eupatorium, lamium, and omphalodes. trollius, and vancouveria. So, go forth and divide! ← OH, IT’S DREARY OUTSIDE!